There are lots of problems that we face in our day to day lives, pollution, corruption, crime and a lot more but consumer rights violations seems the least of this tribulations. My recent experience with Uber reminded me of the fact that companies can and often do take advantage of consumers, we are often misled and treated with contempt at the hands of corporations who knows ordinary citizens feel shy to go to courts. My issue was simple and straight forward; I found that I was not able to link my email with my registered number. My email was registered on a different US number which is now no longer in use. Since it had been a while I logged into my Uber account with my email, I tried to reset the password. Things seemed fine at this point as I was able to reset my password but here’s where things got tricky, Uber uses an extra step of verification but since my US number was discontinued there is no way I’ll ever receive any one time password or verification code. So here I was stuck in a catch 22 situation, I thought I’ll give a call or drop an email and things will be sorted out and that’s when I came across the fact that as a customer I am an untouchable to Uber. 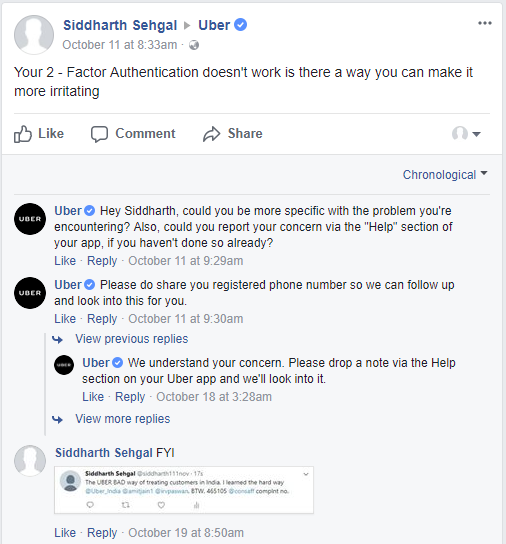 There are certain situations where you actually have to be heard in person or over the phone to straighten things out but with Uber you have to go through app or contact them over social media, which I did and this whole interaction is open for public to see. There is no private messenger or chat applet or any regard for privacy, it’s just an open correspondence. With some grudgingness I gave my phone number and from there it was a wild goose chase with only empty assurances that my problem will be solved. Forms were filled, links were sent and notes were dropped that my issue is being looked into but it never happened. I filled my issue on Oct 11, 2017 but at the time of this writing it still remain unresolved. Shown down below is my interaction with this company that takes advantage of its virtual monopoly in this market. All this could have been resolved with a phone call but Uber is too high to talk to a customer like me. Another interesting thing happened with one of my family member. Her commute to college from home with Uber costs Rs 200 but few days ago she got a lucrative offer of 50% off on her next ride and when she used the coupon, it turns out the ride was now Rs 400 and after 50% off her trip was, you guessed it, Rs 200. These companies are expected to innovate, make things easier for people, solve problems and not con the customers but greed prevails everything. I think you can always make profit without fooling people. As far as my issue goes, I have chosen to go to consumer forum, I don’t think UBER cares. A consumer is the king, we’re told! If there’s a will, there is a way! but when the consumer encounters a problem, a way out is found, and the problem solved without loss of time, when no illegitimacy is involved therein- that’s the practical approach!